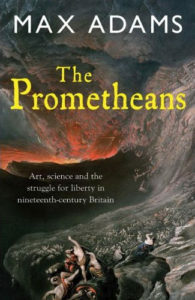 For Max’s second major biography, The Prometheans: John Martin and the generation that stole the future, (London, Quercus Paperback), he was awarded an Elizabeth Longford Award to support research into the life and times of the painter John Martin. Prometheus was the Greek Titan who stole the secret of fire from Zeus and gave it to humans so that they might liberate themselves. In the late 18th century a generation of radical men and women was born who picked up Prometheus’s torch and set out to create a new world. Percy Shelley was their prophet; Geordie artist and radical John Martin was their high priest. Prometheus meant many things to this new generation of individualist idealists: the torch represented the light of hope but also the torch of retribution; the secret of fire represented the arts of metalworking and therefore of the Industrial Revolution – but also of the electrical spark of life which led scientists to invent electricity and Mary Shelley, whose famous novel is subtitled The Modern Prometheus, to envision the price humanity pays for curiosity. Further reading and interest can be found in Max’s article, John Martin and the theatre of subversion (Public Domain Review; 2012). Max looks at the art of John Martin and how in his epic landscapes of apocalyptic scale one can see reflected his revolutionary leanings.